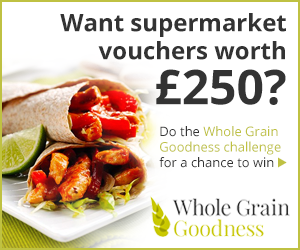 Whole Grain Goodness Challenge on Mumsnet – chance to win supermarket gift cards worth up to £250! We’ve teamed up with Mumsnet, a social network for parents, to run a Whole Grain Goodness challenge competition – to show that healthy eating can be surprisingly good. The challenge – is to include whole grains / whole grain foods in at least one meal or snack per day for two weeks and to tell us what you think on Mumsnet. Most of us know it’s important to eat at least five portions of fruit and veg every day. But did you know high fibre foods are also an important part of a healthy, balanced diet? We should aim to eat at least 30g of fibre a day; but currently only manage, on average, about 18g. Whole grains are a great source of fibre and so it’s beneficial to choose whole grain varieties. Take part in our whole grain challenge and add your feedback on the dedicated Mumsnet discussion board to be entered into a prize draw. If you don’t want to take part on Mumsnet, you can still read what others have to say and hear about their experiences. There’s so many whole grains and foods containing whole grains to choose from! Such as wholemeal breads, flours, rolled oats, whole grain breakfast cereals, rye crackers. Even popcorn is a whole grain food! Or you could perhaps try going half-and-half, like mixing white with wholemeal flour in baking, wild rice with white rice or brown pasta with white pasta. If you already eat lots of whole grain, you can still take part in the challenge, to help us inspire others to eat more delicious and nutritious whole grains. If you have any questions about whole grains, check out our Guide to Whole Grain pages and FAQs. 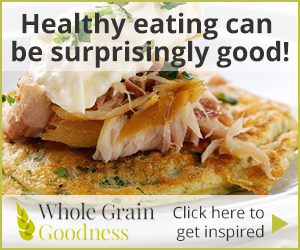 To help you get cooking with whole grains, try our delicious Recipes created by skilled cooks and dietitians, designed to show that healthy eating doesn’t have to be boring – it can be surprisingly good!